How did menopause change from being a natural (and often welcome) end to a woman’s childbearing years to a deficiency disease in need of medical and pharmacological intervention? As she traces the medicalization of menopause over the last 100 years, historian Judith Houck challenges some widely held assumptions. Physicians hardly foisted hormones on reluctant female patients; rather, physicians themselves were often reluctant to claim menopause as a medical problem and resisted the widespread use of hormone therapy for what was, after all, a normal transition in a woman’s lifespan. 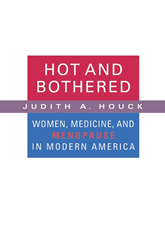 Houck argues that the medical and popular understandings of menopause at any given time depended on both pharmacological options and cultural ideas and anxieties of the moment. As women delayed marriage and motherhood and entered the workforce in greater numbers, the medical understanding, cultural meaning, and experience of menopause changed. By examining the history of menopause over the course of the twentieth century, Houck shows how the experience and representation of menopause has been profoundly influenced by biomedical developments and by changing roles for women and the changing definition of womanhood.